Why we breed & what we stand for. I am committed to breeding beautiful, healthy English Setters with stable temperaments who make great family pets & personal gun dogs. Linwood Setters are bred to be competitive in Conformation AND Field Events. That’s a couple of long sentences with a lot packed into them. I stand behind every word. 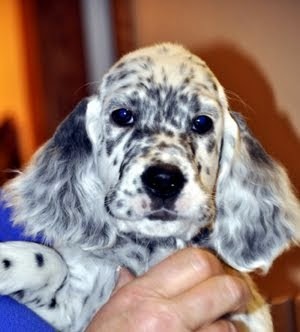 I got my first English Setter from Barbara Oakes in 1978. She was CH Five Oakes Token of Linwood. I drove from Wisconsin to upstate New York and back over a Fourth of July weekend to get “Token”. My life has been filled with travel, friends and these beautiful dogs ever since. I consider it a bonus that Setter People have become my closest friends! I chose my first dog from Five Oakes knowing that line of dogs hailed from the Heljax kennel (where Helen Kilgus’s show dogs were Jack Kilgus’s personal gundogs for many generations behind my Token). I show my dogs at regional and national English Setter Specialty shows all over the US and sometimes in Canada. My dogs have placed and won consistently at a national level. However as beautiful as these dogs are in the show ring their finest moments for me are seen in the field. There is nothing quite as graceful as a Setter covering a grassy meadow in search of birds….. nothing so breathtaking as the intensity of a Setter staunch on point. I have bred close working “Hunt Test” style dogs for many generations now. In recent years I have been breeding for bigger running dogs that can compete in all-breed horseback field trials. Hopefully a Dual Champion is on my horizon sometime soon.